Vatican City, 25 February 2013 (VIS) – The Holy Father sent a telegram of condolence to Bishop Guy Harpigny of Tournai, Belgium on the death of Cardinal Julien Ries, titular archbishop of Bellicastrum and cardinal-deacon of Sant’Antonio di Padova a Circonvallazione Appia. 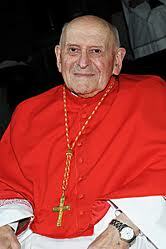 The cardinal died on Saturday at the age of 92. The Pope recalled the cardinal as one of the most renown specialists in history of religions, affirming that “through education and research ... he always had the desire to testify to his faith among his contemporaries in a spirit of dialogue.” Benedict XVI asked God to welcome into the light of eternal life, “this eminent man of faith” and sent his heartfelt condolences to his family and relatives, and to the “Famille de l'Œuvre” Sisters who always accompanied him.